They worked and worked until every piece of mulch was in a flower bed. Thank you dad and mom for showing my boys how to put some elbow grease into it! Owen tried to get a pic of William on his baptism day. who's kids is this anyway?? hello~ keep an eye on your kid... and your camera! ~ Dad, you can take the day off! 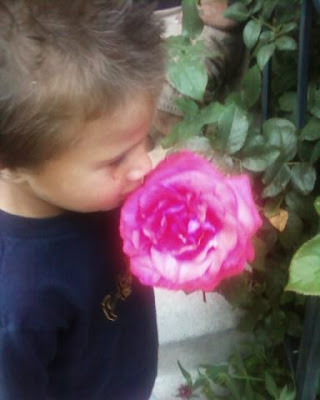 My moms flowers were all in bloom. Glow sticks are a must! And Tommy. Thanks to Carrie for having a tuning Ap on her phone. 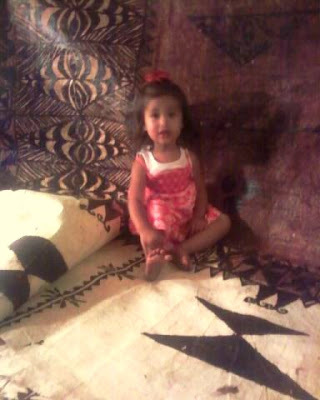 My dad got out his Tongan mat to show me and we sat this little thing on it. She looks right at home!